Lack of hot races suggests turnout might lag. This is one of the most exciting and suspenseful midterm elections in years on the mainland, but a lack of hotly contested local races suggests voter turnout could remain low in Hawaii today. Star-Advertiser. Early Voting Is Way Up Nationwide, But Not In Hawaii. There’s a lot of drama on the mainland with control of Congress up for grabs. Hawaii’s races hold less suspense. Civil Beat. Hawaii General Election: 180K Votes Already Cast. Hawaii Public Radio. Despite easier registration rules, early voting figures remain low. Hawaii’s voter turnout is the lowest in the nation. Hawaii News Now. Democrats from across the state gathered at Mooheau bandstand Monday evening for their traditional pre-election Grand Rally, where several hundred of the party faithful ate chili, enjoyed entertainment and heard speeches from federal, state and local candidates. West Hawaii Today. Hawaii’s GOP focusing on conservative-leaning districts in battle against blue wave. There are only five elected Republicans in the state. Hawaii News Now. Advocates rally to push Native Hawaiian voters to the polls. ‘They say Hawaiians don’t vote. We want to prove them wrong.’ Hawaii News Now. Candidates for Hawaii’s top elected office are focusing on a persistent problem that has only gotten worse: the high cost of housing on the islands. Associated Press. A coalition of powerful unions, business interests, environmentalists and others has raised $740,000 in its effort to defeat this year’s ballot measure asking voters whether they want to convene a state constitutional convention, according to the latest campaign spending reports filed Monday. Star-Advertiser. High-Profile PR Firm Is Getting Involved In Hawaii Politics. A company that made a big splash by hiring away public officials has aided the campaigns of the teachers union, an OHA candidate and a Maui super PAC. Civil Beat. Here’s what you need to know for Tuesday’s Midterm Election. Hawaii Public Radio. Are you a first-time voter? Here’s all you need to know for Election Day. Polls open statewide Tuesday at 7 a.m. and close at 6 p.m. Hawaii News Now. Reminders, tips to know before you vote in Tuesday's general election. KHON2. Election Day Hawaii Information. If you're headed to the polls here are some things you need to know. KITV. Ride-hailing companies Uber and Lyft both said they will offer discounted rides to the polls in Hawaii on Election Day. Star-Advertiser. Some Progress Made on Strike Negotiations. Leaders of the hotel workers union Unite Here! Local 5 met with management of five hotels owned by Kyo-Ya over the weekend to try and bring an end to a four week worker strike. Hawaii Public Radio. Matson’s earnings surge on tax cuts. Matson Inc. operated on a fairly even keel in the third quarter balancing higher revenue and expenses, but the Honolulu company benefited from lower taxes to boost its profit 22 percent. Star-Advertiser. Short-term bonds to help fund rail. Honolulu Mayor Kirk Caldwell said Monday that his administration will use proceeds from the sale of short-term commercial paper to supply the city’s beleaguered $8 billion-plus rail project with $44 million to show “skin in the game” being required by federal transit officials and the state Legislature. Star-Advertiser. Honolulu To Take Out Short-Term Loan Of $44 Million To Keep Rail Going. This marks the first time that city property tax revenue will be used for the project. Civil Beat. Mayor Caldwell reveals preferred funding mechanism to secure $44M for Honolulu's rail project. Pacific Business News. Here’s how the city plans to pay $44M for the rail project. ‘We’re probably taking the safest route, the least painful route.’ Hawaii News Now. Honolulu unveils latest rail plans. Beginning in January, homeowners on O'ahu will start paying for rail through property taxes. KITV. Council committee hobbles sidewalk-clearing bills. Honolulu City Council members are doubling down on their insistence that Mayor Kirk Caldwell submit more detailed reports on how he’s tackling homelessness before they’ll allow him to implement two new sidewalk-clearance laws. Star-Advertiser. Victim Advocates Withdraw From Partnership with Honolulu Police. The Domestic Violence Action Center will return $400,000 in grants because HPD didn’t use its services when responding to domestic violence calls. Civil Beat. There's a big increase in crime due to 15 cents bag fee on Oahu, says Retail Merchants of Hawaii. KHON2. Honolulu will be under increasing risk of flooding and other damaging storm impacts as climate change shifts the historical pattern of hurricane tracks and raises the ocean level to make the islands more vulnerable, according to a study led by researchers at the University of Hawaii at Manoa. Star-Advertiser. Sales dip, but Oahu home prices rise 4%, Locations report says. Home prices on Oahu rose by 4 percent over the 12-month period that ended Oct. 31, while sales of single-family homes declined by 3 percent, and condominium sales declined by 1 percent, according to a report by Honolulu real estate firm Locations. Pacific Business News. Thurston Lava Tube likely to remain closed until 2019. While much of Hawaii Volcanoes National Park has reopened since its historic closure earlier this year, some parts likely will remain closed until at least next year. Tribune-Herald. Improvements planned for rodeo arena in Honokaa. Honokaa Rodeo Arena will close from Nov. 14-Jan. 14 so improvements to the facility can be made. Tribune-Herald. Humpbacks arrive fashionably early off Kohala Coast. West Hawaii Today. The median price of a condominium on Hawaii’s Big Island rose by more than 26 percent last month despite fewer sales, compared to a year ago, while both sales and prices declined for single-family homes, according to statistics provided by Hawaii Information Service on behalf of Hawaii Island Realtors. Pacific Business News. Polls will open starting at 7 a.m. Tuesday as voters statewide cast their final ballots for county, state and congressional races. Maui News. Spending report: Victorino paid D.C.-based media consultant $50K. Cochran’s largest expenditure was just under $3,000 during same period in Maui County mayoral race. Maui News. Commentary: Win for public’s right to know. The Maui News won an important court battle Thursday when the three psychiatrist/psychologist reports were released by 2nd Circuit Judge Peter Cahill in the Ashley Wellman case. Maui News. 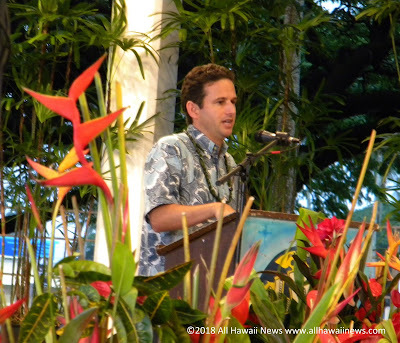 Maui visitor numbers slowed but still up in wake of Olivia. Vistor spending in September also up but only 2nd time this year with less than $400 million. Maui News. The Kula Forest Reserve, Waipoli access road, Kahikinui Forest Reserve – Papaanui Tract, and Polipoli Spring State Recreation Area reopened on Friday following completion of a two-month project for road repairs, road safety improvements, and fuel mitigation work. Maui Now. An islandwide power outage that struck early Monday afternoon affected all 25,800 Kauai Island Utility Cooperative members. Garden Island. Kauai Island Utility Cooperative said it has been able to restore power to all of its 25,800 members on the Garden Isle after a trip at its Kapaia Power Station caused an islandwide power outage. Pacific Business News. Crews from the Department of Public Works finished laying a new sewer pipe at Kuhio Highway and Leho Drive Sunday night and began demobilizing as they wrapped up a days-long effort to repair and clean up a sewage spill and get traffic back to normal. Garden Island.